The track, located in Gladeville, Tenn., 40 miles east of Nashville, has struggled with attendance since opening in 2001. Should Dover sell the track, it is possible that the new owner could pursue future NASCAR races, although that failed to happen when Dover sold its tracks in Memphis and St. Louis. If the track is not sold, apparently it will be simply shut down. The facility is situated on approximately 1,400 acres, and the track’s 1.3-mile concrete surface makes it unique on the NASCAR circuit. It is lighted for night racing and overall is considered a state-of-the-art facility. However, the racing has never been especially exciting and fans have not turned out as anticipated. When the track opened it had 25,000 permanent grandstand seats and 25,000 temporary bleachers. When the inaugural event failed to sell out, most of the temporary bleachers were dismantled. Attendance has continued to decline, with perhaps 10,000 on hand for the last race on July 23. The track was dealt a major blow when the Indy Racing League severed its relationship following the 2008 season. For eight seasons (2001-08) the annual IRL race had been the track’s highlight event, with such star attractions as Danica Patrick and Helio Castroneves. The IRL races drew crowds of around 20,000. Once the IRL departed, the track was left with only Nationwide and truck races – second- and third-tier NASCAR events. The past two seasons the Superspeedway hosted two weekend Nationwide/truck doubleheaders, neither of which drew well. Most observers remain convinced that if the track could have landed a premier NASCAR Sprint Cup race it could have been a huge success. But as prospects of a Cup race faded over the years, so did the track’s future. While the down economy is putting a damper on many tracks and teams, and getting a Cup date is icing on the cake, other tracks have done well as stand alone tracks such as Kentucky and Iowa. They still fill the grandstands. People can say whatever they choose to say, but for me the bottom line is lack of promoting and marketing! 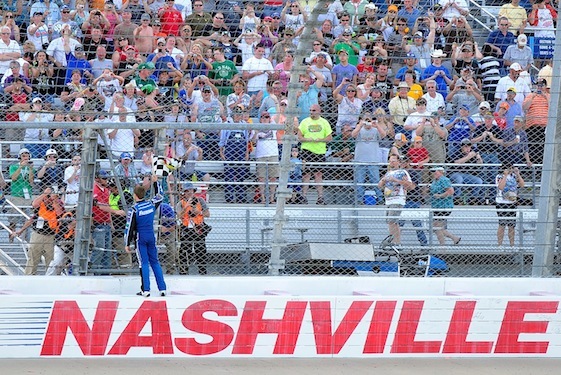 There is no good reason a track right next to Music City USA couldn’t find a mere 25K fans to fill a grandstand! My brother lives near Chattanooga and he didn’t even know when the races were here at the superspeedway unless I told him. Dover is notorious for not supporting public relations teams and so-so with a great marketing plan. If one has a Cup date, and those are suffering too right now, the races basically self-sell because, well, it’s Cup, but to have a good showing at stand alone tracks one….MUST….have….a….PR….Marketing….plan! I’ve said it for years and I’ll always believe that! I feel people need to support what Nashville does the Best:Short Track Racing and one day Sprint Cup will return to the Fairgrounds. Not because it is fancy, but, I feel NASCAR would be thrown in a corner to need Race Dates. I am disappointed in this news, but am not surprised. Living in nearby Franklin, the drive out to Lebanon was still just not worth the effort to justify a single-event ticket. A few years back, the truck race was supported by ARCA, and for $25 one could catch Truck Qualy, ARCA race, and the Truck Race. These three events made for an enjoyable evening and a great value. The event that year also represented the last time I saw a competitive race. Scott Speed held a clinic in ARCA, and Johnny Benson fought back from a lost lap to take the Truck race. For me, the key to enjoyment was the addition of the support race… be it the aforementioned ARCA race, or the Infiniti/Indy Lights race that supported the IRL. Part of me wonders if a more interesting track would appear with a simple coating of asphalt?